Mount Evans. The drive to the top of this 14,266-foot mountain peak is incredibly beautiful. When you get to the top, you’re in for beautiful views of the city and the landscapes beyond Denver. 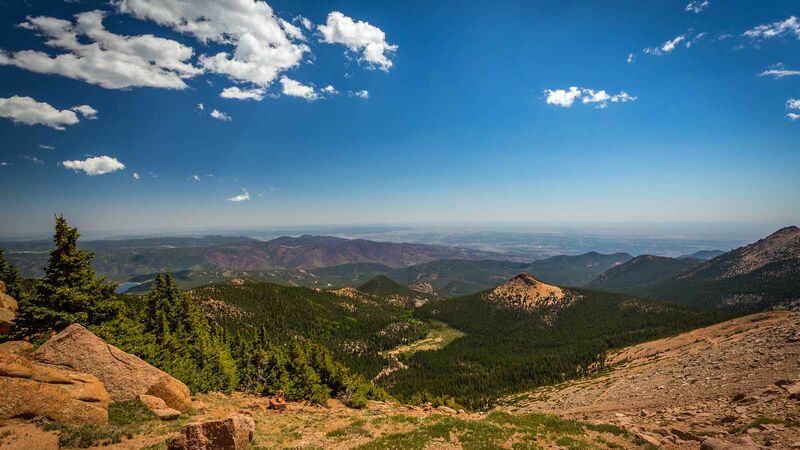 As one of the most popular tourist attractions in the city, Mount Evans does get busy, but early mornings on the weekends, and weekday mornings tend to be less crowded. 2 Larimer Square. A stroll through this quaint section of Denver feels as if you’ve traveled back in time. Here, you’ll find lots of unique shops and art galleries to explore inside of stately buildings, which have been restored to look how they did during the Civil War. There are also many restaurants and bars in Larimer Square, so you can easily make a day of your visit here. Kirkland Museum of Fine & Decorative Art. Situated in the oldest commercial space in Denver, this unique museum has a collection of arts and crafts, pop art, and modern art made by local artists. Even if you don’t know much about art, you can enjoy the exhibits here, as everything is very well explained. Denver Museum of Nature & Science. This science center is a hit with both families and adults traveling alone. Home to an IMAX theater and a planetarium, the museum hosts different exhibits throughout the year, and has some interesting permanent collections, including a selection of dinosaur bones and earth minerals. Beer Tastings. Colorado is known for beer, and taking a beer tasting tour is a great way to try some of the local favorites. These tours typically take you to a number of breweries, where you get to learn about different varieties of beer and then take a taste. A number of different providers in the Denver area offer these experiences. Denver Botanic Gardens. You can get up close to nature without leaving Denver by taking a walk through these beautiful gardens. One of the biggest urban gardens in the US, it covers 23 acres and is divided into 43 sections. It can take an entire day to see all of the park, or you can choose one part to explore before going to see other attractions in the city. Make sure you have your smartphone or camera; this place is filled with beautiful photo ops. Coors Field. Home of the Colorado Rockies Major League Baseball team, Coors Field is known for its beautiful views of the mountains. When there is no game or other event scheduled, you can take a tour of the facility and get a behind-the-scenes look at the stadium. The tours last for 1.5 hours and are fun for people of all ages. Make sure that you drink a lot of water during your first day or two in Denver and keep alcohol consumption to a minimum. This will decrease your risk of altitude sickness, which many people suffer when they first arrive in the Mile High City. Don’t be fooled by the elevation! Denver can be very hot in the summertime. Make sure to check the weather report before you pack, so you can be properly dressed for the weather. It’s not necessary to wear a tie at most restaurants in Denver. Dress codes tend to be more relaxed in the city. Right turns on red are legal when it is safe to turn. In many neighborhoods, the streets are named alphabetically, making it easy to find your way. No matter where you are, anything named “Street” is going North and South, while anything named “Avenue” is going East and West. If you don’t know where you’re heading, look to see where the mountains are. When they’re on your left, you are facing north. Get a Mile High Culture Pass if you plan to visit multiple museums and cultural sites. The pass gets you into seven popular places and gives you big discounts on others. It’s legal to use marijuana in Denver, but you need to be discreet if you plan to hit a dispensary. Open public use of marijuana is not legal, so plan to take your best wax pen (see VaporPlants) that you can use without disturbing those around you.